|| Description: Our accordion-style rock books are both an assessment tool and reinforce what students have learned about the rock cycle. Students fill the pages with illustrations of the formation of igneous, sedimentary, and metamorphic rocks. On each page they paste a paragraph explaining the rock’s formation – but it’s the illustrations of volcanoes, oceans, and mountains that tell the real story. The book is completed with a sleek cover (pictured above), and then becomes a permanent reference that the student can use all year long – and beyond! 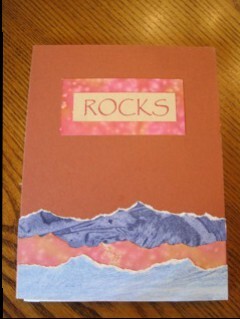 See our page on bookmaking for more book ideas. || Prerequisites: Students should be learning about the rock cycle, and preferably have covered the forming of igneous, metamorphic, and sedimentary rock.